VANCOUVER, CANADA – May 24th, 2018: Sitka Gold Corp. (CSE: SIG) (the “Company” or “Sitka”) is pleased to announce that the first drill hole has been completed on its Adobe Gold property (“Adobe” or the “Property”) located 40 kilometres north of Elko, Nevada. The Company is exploring for Carlin-Type gold mineralization in an area of the Adobe Range Mountains that has the necessary structural features and geochemical signature for such potential mineralization to occur at depth. Reverse circulation drill hole A18-01 was drilled northwest at azimuth 300, -70 degrees inclination to test an IP chargeability high anomaly and prospective Early Mississippian to Late Devonian stratigraphy in the company’s target A area. The hole was drilled to a total depth of 1510 feet (460.24 metres) and was successful in reaching the targeted upper Tripon Pass Formation from a transition depth of 980 feet (298.70 metres) to the bottom of the hole. The upper Tripon Pass Formation consisted of mixed calcareous and siliceous siltstones and a 20 foot (6.1 metre) interval of limestone and calcareous matrix sandstone. The formation included a weakly pyrite mineralized fracture network, strongly carbonaceous intervals and localized clay alteration or gouge, all of which probably contribute to the IP chargeability anomaly coincident with this interval. All samples from this hole have been shipped to Atclabs in Kamloops, BC. A18-01 intersected Permian limestone, calcareous siltstone, sandstone and chert pebble conglomerate to a depth of 327 feet (99.67 metres) where it encountered the Permian-Mississippian unconformity. An alteration zone of decalcification, silicification, and oxidation was present at and above the unconformity, which also contained iron oxide, minor remnant pyrite, and abundant carbon which produced a heavy black film on the drilling discharge water. Below the unconformity, an anomalously thick section of Chainman Shale (carbonaceous siltstone and shale) was cut, before mildly calcareous rocks of upper Tripon Pass formation were intersected at 980 feet 298.70 metres). The drill rig has been moved to target area B where an initial hole is now collared. Hole A18-02 will drill southwest at azimuth 135, -70 degrees inclination. The hole will test the northwest side of a similar, but stronger, IP chargeability high anomaly to that found in Target A. If this IP anomaly has a similar cause, which surface mapping suggests it may, the hole should test the flatter northwest limb of an anticline. This would provide a much more favorable angle to bedding and allow the hole to cut farther into the target stratigraphy, which becomes more calcareous and prospective with depth. 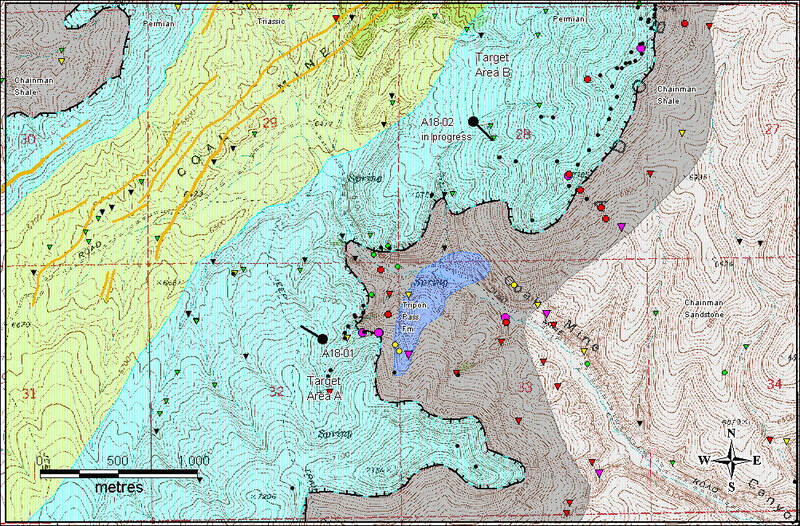 The location of drill holes A18-01 and A18-02 are shown on the attached map (Figure 1) and can also be viewed on Sitka’s website (www.sitkagoldcorp.com). Sitka plans to drill up to 3000 metres in 6 holes with a reverse circulation drill rig, at the Adobe Gold project. This will be carried out in stages to allow sufficient time for assays to be completed and results to be analyzed. All samples will be analyzed by Actlabs in Kamloops, BC, an ISO/IEC 17025 Accredited Laboratory by the Standards Council of Canada. The samples will be fire assayed for gold with Atomic Absorption Finish as well as geochemically analyzed for a 63-element suite by ICP-MS methods.